At homify, we are always excited about homes that feature a mix of materials. They bring different textures and tones to a design and they show us how much potential exists when it comes to incorporating nature into modern and contemporary architecture. This is why today we are delighted to bring you a project from design professionals David James Architects & Associates LTD. 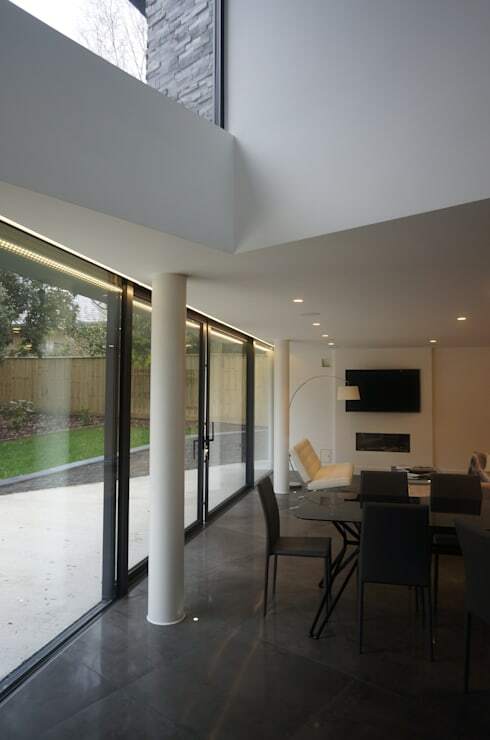 This UK-based home is the perfect example of how raw materials can be incorporated into a very stylish and edgy home. As we explore this home further, you will also pick up some tips and tricks for your own home when it comes to combining the functional and the trendy. You won't believe what the house of this entrance hall features either! From the outside of the home, you can immediately see what we mean by a mix of materials. 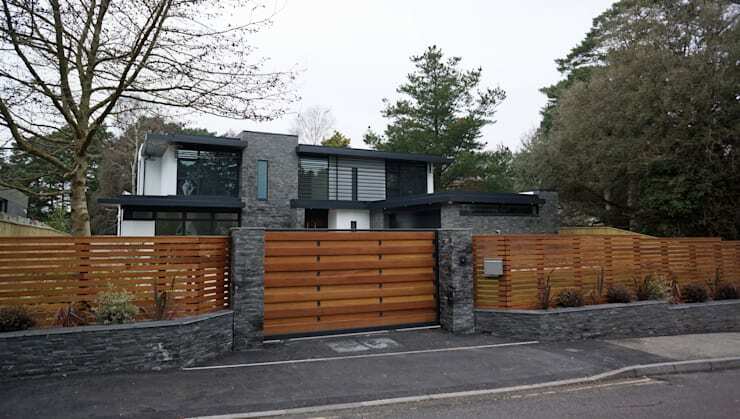 The perimetre fence and gate is a gorgeous, light wood while the pillars and flower beds are made with a darker stone cladding. This is an exterior design that will turn heads! These two different materials and colours contrast beautifully and create a very sophisticated yet slightly rustic look and feel. The design is further enhanced by the beautiful trees and flowers that have been planted in the flower beds outside the home. Remember that this is the first impression that people will get of your home so its worth investing in a beautiful perimetre fence and gate and spending time working on your verge. Plants and flowers go a long way! Once we are through the front gate, a beautiful driveway sweeps us up to the double garage and front door. 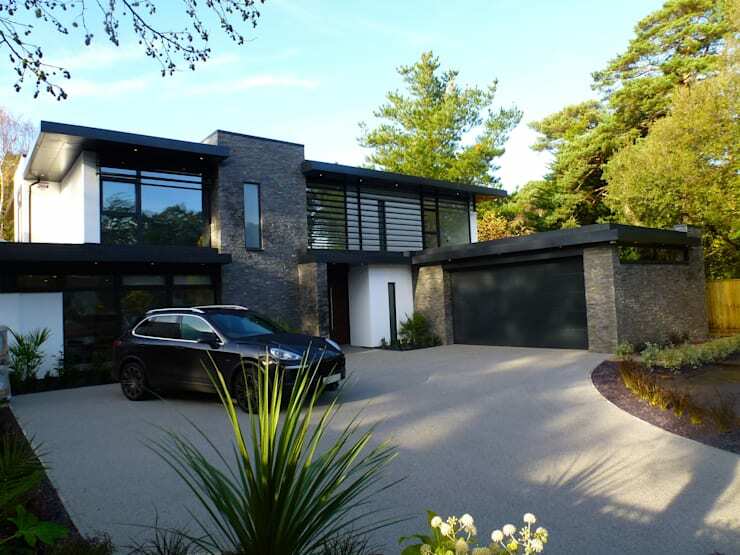 The facade of the home is simply gorgeous with dark stone glassing, charcoal black finishes and an abundance of glass. This is innovative and modern architecture at its best. The double garage neatly hides cars, bicycles and other storage items so that the exterior design is organised, simple and beautiful. The driveway allows more than enough space for friends and family to park their cars safely behind the front gate too. The front door rests under the shelter from the second-storey, which is a must for any home. It keeps guests out of the sunshine, heat, wind or rain while they ring the bell. Once friends, family and guests step through the front door, the first impression that they get of the house is very important. Yet you also want this area to be functional so that they have more than enough space to shrug off their jackets, hug and kiss the residents hello and put down their handbags. This entrance has hit the nail on the head, with a minimalist and edgy style that is easy to replicate! 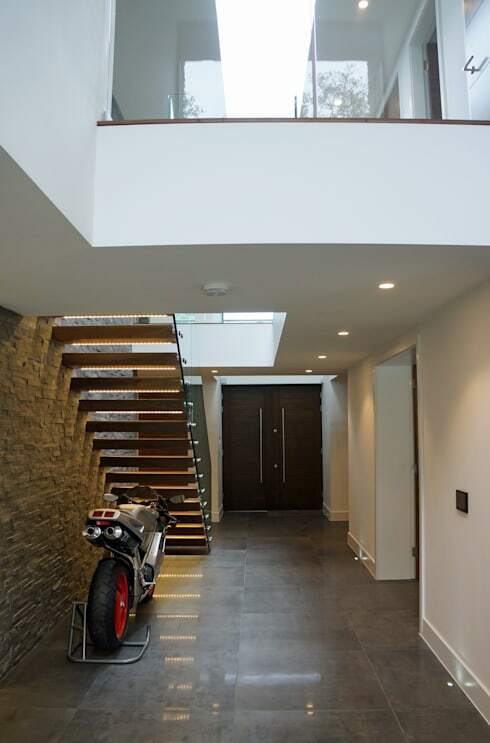 In fact the only thing that decorates this space is a gorgeous motor bike underneath the stairs. This is not only stylish and trendy, but it gives us a clue as to what the interests of the residents are—a great talking point as people walk through the front door. You'll also notice that this space is well-lit with dimming lights in the ceiling and the natural light that comes through the large glass windows. This creates a warm and homely environment. Have a look at these 7 impressive ideas for your entrance for more inspiration. 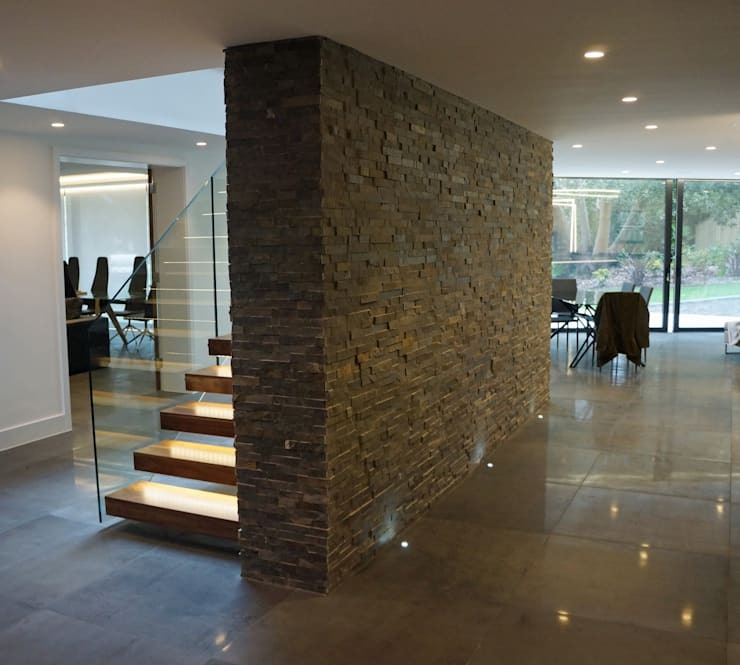 The wall in the living space features the same stone cladding that we saw throughout the exterior space, which makes for a very beautiful and striking interior design. A touch of nature inside the home immediately connects it to the outdoors and brings an earthy and cosy ambiance to the space. You'll notice that it hasn't been used excessively, however. A few simple touches here and there can do the trick. The staircase is a wonderful example of how function and design collide. 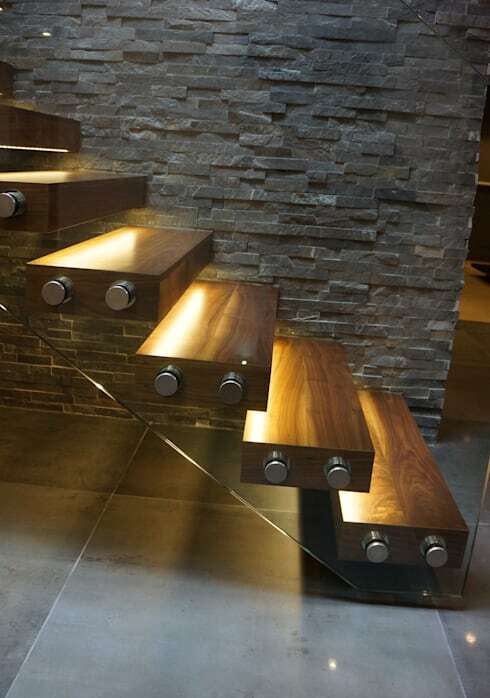 The designers have gone for floating wooden stairs with a glass banister, which is simply stunning. They've installed little lights underneath each step, which illuminates the detail of the staircase and enhances the design itself. The wood also contrasts beautifully with the stone wall, again mixing up textures and tones for a gorgeous design. 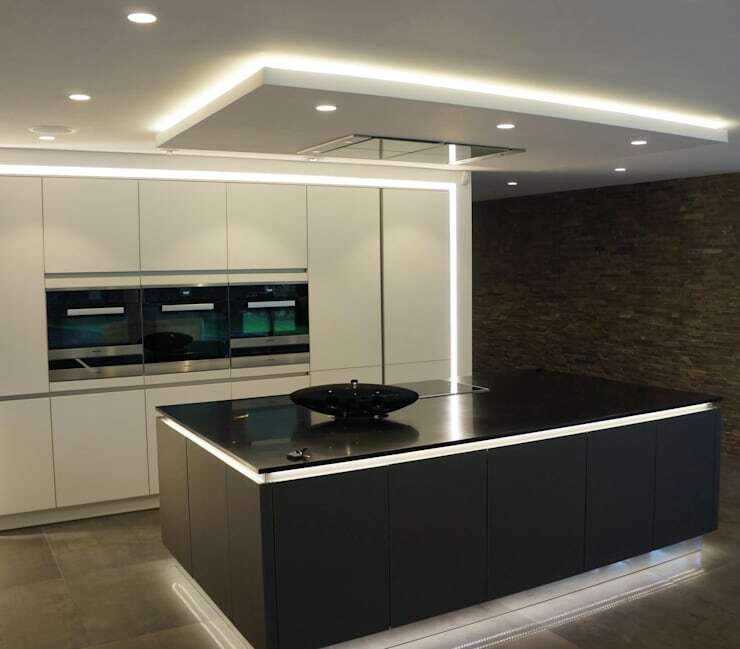 The kitchen features edgy black and white tones, which shows how different styles can be implemented throughout an interior design. Black and white are two very striking colours when used together, as we can clearly see here. For the kitchen, they are perfect because they enhance a minimalist and functional look and feel. You'll notice that there is nothing littering the counter tops or the surface of the kitchen island in this space. Everything is stored neatly away, which allows for that edgy and clean look and feel. This makes for a very well-organised, functional and visually appealing cooking area. Have a look at these 10 fabulous black and white kitchens for more examples of this trendy design. Here we can see how the living spaces of the home are set in an open plan design, which makes for a very spacious and interactive family space. Again, the designers have gone for a neutral colour palette, which ensures the home maintains its sophisticated and elegant look and feel. Thanks to the large glass windows and doors, the living space opens up onto the beautifully garden, directly connecting it with the nature that surrounds it. We end off our tour in the bathroom, which often gets overlooked in a home design. Yet it such an important room! This space features a mix of materials too, with beautiful wooden floors, brown tiled walls and trendy wooden furniture. 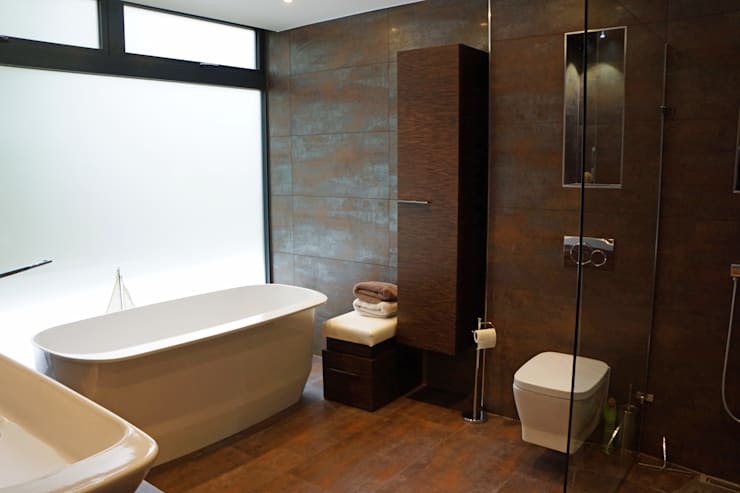 The brown tones contrast beautifully with the modern, white bathroom features. The entire one side of the room is a frosted window, which again allows natural light to flow into this little area. However, the family's privacy is not compromised in any way. This home is simply stunning with its mix of materials. If you've enjoyed it, you'll love this project too: natural elements shine in this one of a kind home. Are you impressed with this fabulous home?